Patient Services | Where the patient comes first! According to the American Diabetes Association, about 29.1 million Americans have diabetes. Nervous system damage (numbness/tingling/burning called neuropathy) affects about half of those diagnosed with diabetes and is a major complication that may cause diabetics to lose feeling in their feet or hands. Foot complications are a big risk in diabetics. Diabetics must constantly evaluate their feet to prevent debilitating consequences, including wounds, infections and amputations. With a diabetic foot, a wound as small as a blister from wearing a poor fitting shoe can cause a severe consequence. Diabetics commonly have poor circulation, so injuries can be extremely slow to heal. When a wound has developed and is slow to heal major concerns include poor blood flow, infection or too much localized pressure to the area. Infections can be very rapid so diabetics should inspect their feet every day. Preventative measures include looking for puncture wounds, bruises, pressure areas, redness, warmth, blisters, ulcers, scratches, cuts and nail problems. If diabetic neuropathy develops, the feet are at risk for becoming deformed. Foot deformities increase a wound potential which can be a high risk for an infection to develop. A complication of neuropathy is a serious foot bone condition called Charcot (pronounced “sharko”) arthropathy. This condition causes the foot bones to fracture and collapse, warping the shape of a foot. Often this severe collapse is not recognized by the patient because of the lack of sensation despite the serious injury. There are various treatment modalities for diabetic neuropathy that range from medications, vitamins, padding, shoe gear changes, nerve devices and surgical interventions. Charcot changes are treated with various conservative or surgical methods, depending on the extent of the disease. At the Foot and Ankle Center we strive to prevent advanced foot disease. We are trained to look for potential problem sites and also to educate our patients about treatment options. If problems do develop, we focus on that specific complication to find the right solution. Don’t get your feet wet in snow or rain. Always keep your feet warm. Don’t smoke due to the increased risk of vascular disease. Don’t use a heating pads or sharp instruments on your feet. Have a podiatrist trim the nails. Use moisturizing lotions or creams to keep the skin soft and moist, but avoid lotions/creams between your toes. Wash your feet every day with mild soap and warm water. When drying your feet, pat each foot with a towel and don’t forget to dry between your toes. Buy shoes that are comfortable and supportive. Check how your shoe fits in width, length, back, bottom of heel, and sole. Avoid pointed-toe styles and high heels. Try to get shoes made with leather upper material and deep toe boxes. Wear new shoes for only two hours or less at a time. Inspect the inside of each shoe before putting it on. The Foot and Ankle Center carries orthopedic footwear and innersoles. Foot and Ankle Center deals with various sports related injuries and conditions. We treat many athletes from local colleges and universities, as well as pediatric sports injuries. These conditions range from overuse injuries such as shin splints, stress fractures, tendonitis, plantar fasciitis, and other various inflammatory conditions. We also deal with large variety of traumatic sports related injuries ranging from fractures, dislocations, tendon tears or ruptures, and sprains. Treatment is based on severity and type of injury and the ultimate goal of the patient. These treatments range from bracing, anti-inflammatories, inserts, physical therapy, and surgical intervention. Foot and Ankle Center deals with a high volume of traumatic fractures and other various traumas to the foot and ankle. These include open and closed fractures, crush injuries, dislocations, tendon ruptures, traumatic wounds, compartment syndrome, and soft tissue injuries. Treatment for these injuries is based on the severity and type of injury. Treatments can range from immobilization to emergent surgical intervention with internal or external fixation. We take trauma and ER call from Lankenau, Bryn Mawr and Paoli Hospitals. We also see emergent trauma and fracture care within the office setting. A bunion is a mal-alignment of the great toe joint. 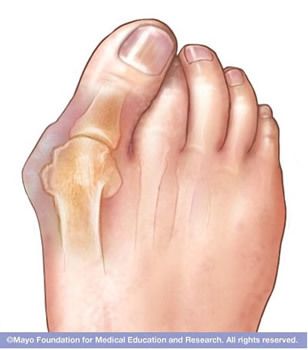 To the eye, it appears as a bulging, bony bump on the joint at the base of your big toe. Bunions form when your big toe pushes up against your other toes, forcing your big toe joint away from the normal shape of your foot, enlarging the joint and crowding your other toes, sometimes causing pain. Bunions are almost always caused from a hereditary component. Wearing shoes that fit too tightly is not a cause of a bunion and more of an aggravating factor. Bunions can also develop as a result of trauma or a medical condition, such as rheumatoid arthritis or gout. Changing shoes design that provides plenty of space for your toes. Having the toe box of the shoe stretched. Shoe inserts. Padded shoe inserts or over-the-counter arch supports can provide relief along with prescription orthotic devices. Surgery is only recommended for patients that are in pain. Cosmetic bunion corrections are not recommended. A number of surgical procedures are performed for bunions. Surgical correction is based on severity of deformity, arthritic changes in the joint, mobility of the joint and age of patient. Post-operative recovery time depends on the procedure completed. Plantar fasciitis is a very common inflammatory condition that involves the plantar fascia of the foot. The plantar fascia is a support structure for the arch of the foot, and an extension of the Achilles tendon. This inflammation can occur from trauma, biomechanical issues, poor shoe gear, but most commonly occurs without a specific injury. Plantar fasciitis is rarely accompanied by swelling. Pain is described on the bottom of the heel or arch. Pain occurs usually after periods of rest or with activity. Symptoms can worsen or improve with shoe gear. Treatment always starts with an Achilles and fascia stretching program. Other treatments include supportive shoes, inserts, anti-inflammatory, cortisone, physical therapy, immobilization and amniotic injectable. Surgical intervention is a last resort. Although surgery is rarely needed, sometimes surgery is warranted. Surgery is completed when all conservative modalities have failed. The surgery is completed usually with either an endoscopic plantar fascial release, percutaneous release, or the use of a Topaz surgical technique. This choice is based on surgeon preference. All of the doctors in the Foot and Ankle Center work at the Wound Healing Centers located at Bryn Mawr, Paoli, and Lankenau Hospitals. Refer to the Locations page for further address information. We are experts in dealing with diabetic, venous, traumatic, lymphedema, pressure, and infected wounds. All physicians at our practice have admitting inpatient hospital privileges for emergent needs. We use all of the latest technologies to heal the most difficult and complicated wounds. We also specialize in limb salvage. Treatments vary from topical prescription medications, antibiotics, various dressings, offloading techniques, compression therapy, wound vac therapy, and surgical interventions. Hyperbaric oxygen is another treatment modality that is sometimes utilized for specific cases. Arthritis is a group of inflammatory conditions involving damage to the joints of the body. There are many different forms of arthritis. The most common form, osteoarthritis (degenerative joint disease) is commonly a result from trauma to the joint, infection, poor bio-mechanics, age, hereditary and many other causes. Other forms of arthritis include rheumatoid arthritis, psoriatic arthritis, and related autoimmune diseases. The major complaints by individuals who have arthritis are joint pain, swelling and stiffness. The pain from arthritis occurs due to inflammation that occurs in and around the joint. Osteoarthritis is the most common form of arthritis. It can affect both the larger and the smaller joints of the body. The disease is most commonly acquired from daily wear and tear of the joint. Family history also plays a role in developing osteoarthritis. Osteoarthritis typically affects the weight bearing joints like the feet, knees and hips. Osteoarthritis, like rheumatoid arthritis, cannot be cured, but one can prevent the condition from worsening. When it deals with the foot and ankle, orthotics, alterations in shoe gear, and many braces may help a significant amount. Cortisone injections are also sometimes helpful and warranted. Alterations in athletics impact sports and anti-inflammatory medications are widely used by individuals with osteoarthritis. Weight loss is also helpful to improving symptoms and preventing progression. When the disease is advanced and the pain is continuous, surgery may be an option. Surgery is based on failing conservative care, the amount of joint damage, age of the patient, overall recovery demands. Many common surgeries for arthritis range from cleaning up the joint/spurs (cheilectomy), to implants and fusions. Rheumatoid arthritis is a disorder in which the body’s own immune system attacks its own tissues and joints. The attack is not only directed at the joint but often too many other parts of the body. In rheumatoid arthritis, most damage occurs to the joint lining and cartilage. Rheumatoid arthritis affects joints in the feet, fingers, wrists, knees and elbows. The disease is bilateral (affects both sides of the body) and symmetrical which can lead to severe deformity if not treated. Rheumatoid arthritis begins most often between the ages of 40 and 60, but can occur at any age. In children, the disorder can present with a skin rash, fever, pain, disability, and limitations in daily activities. With earlier diagnosis and aggressive treatment, many individuals can lead a respectable quality of life. The drugs to treat rheumatoid arthritis range from non-steroidal, anti-inflammatories, corticosteroids to other immunosuppresants given intravenously. Surgery may be required to realign, fuse or replace joints. Gout is caused by deposition of uric acid crystals in the joint, causing inflammation. There is also an uncommon form of gouty arthritis caused by the formation of rhomboid crystals of calcium pyrophosphate known as pseudogout. In the early stages, gouty arthritis usually occurs in one joint, but with time, it can occur in many joints including tendons and acute flares are extremely painful and crippling. In our practice gout is a very common problem. This is usually treated by a variety of medications (indomethacin, colchicine, or steroids) for acute gout attacks. Sometimes intra-articular injections, immobilization, alteration in diet, avoidance of alcohol, and narcotics are also needed. If the cause of an acute gouty attack is from a medication, then alteration in this medication may be needed. For the chronic stages of gout, treatment greatly changes. Diet, foot support, and a lowering uric acid medication is common to prevent further joint deterioration and pain. Surgery is usually avoided due to possibility of increasing or worsening a gout attack. Diagnosis is made by clinical examination, and may be supported by other tests such as radiology and blood tests, depending on the type of suspected arthritis. All types of arthritis potentially feature pain and pain patterns may differ depending on the specific arthritis and the location. Gout is associated with acute, severe pain with joint swelling, redness and warmth to the affected area. Elements of the history of the disorder guide the diagnosis. Important features are speed and time of onset, pattern of joint involvement, symmetry of symptoms, early morning stiffness, tenderness, or locking with inactivity, aggravating and relieving factors, and other systemic symptoms. While neither rheumatoid arthritis nor osteoarthritis can be completely prevented, one can reduce the risks by becoming physically active, participating in physical therapy, losing weight and eating healthier. All individuals who have pain in the joints should seek early diagnosis because the earlier the treatment is started, the better the prognosis. Gout attacks can be prevented by understanding your family history and predisposing factors with medications and diet. 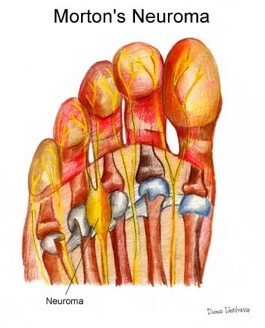 A hammertoe is a deformity of the joint of the second, third, fourth or fifth toe, causing it to be functionally or permanently bent, resembling a hammer. Hammertoes can result from wearing poorly fitting shoes that have forced the toe into a bent position. However, the most frequent causes are more genetic in nature. If your mother or father had hammertoes, you are likely prone to as well. This is related to foot type and function and, over time, arthritic changes and muscle imbalances can facilitate hammertoes. It can also be caused by muscle, nerve, or joint damage resulting from conditions such as osteoarthritis, rheumatoid arthritis, stroke, Charcot-Marie-Tooth disease or diabetes. In many cases, conservative treatment consisting of shoe accommodations, padding, and shoes with soft, spacious toe boxes can be enough to resolve the condition while, in more severe or longstanding cases, surgical intervention may be necessary to correct the deformity. Surgery such as releasing the joint contracture by removing a small wedge from the joint, a fusion or pin fixation are decided upon depending on the extent and type of deformity. An ingrown nail (Onychocryptosis) is a very common condition that is caused when the offending nail is growing or being pushed into the nail fold or skin. This will lead to significant pain and sometimes develops mild to severe infections. Nail care is a common treatment for diabetics and other patients that either are at risk secondary to poor circulation or have various disabilities. This treatment includes appropriate trimming of ingrown, fungal, or abnormal nails. Decisions are made about whether topical and oral treatments or surgical interventions are necessary for further treatment. Sometimes nail biopsies are completed for aiding in appropriate diagnosis. An orthotic is an insert, either soft or firm, which replaces the insole of your sneaker. Orthotics can be expensive; therefore, we recommend not spending much more than $60 on an over-the-counter orthotic. We carry affordable over-the-counter inserts that are $40 or less. Second, orthotics help slow down pathologic motion, such as overpronation or oversupination. Although over-the-counter orthotics work, custom orthotics are sometimes needed for additional support or a need for a custom fit that the over the counter product can’t give. Therefore, we use a combination of both depending on the patient’s needs. Custom orthotics are made out of higher-grade materials that last longer and are more expensive. When a custom orthotic is necessary, it is crucial that a podiatrist is involved, as the wrong type of orthotic can actually make people feel worse or even cause a different problem. Over-the-counter orthotics typically last about one year. Custom orthotics usually last three to five years – sometimes longer. This depends on the type of activity and the material that the orthotic is made from. Also, the more running one does, the quicker the orthotic will wear out. With children, we usually replace orthotics every two shoe sizes, depending on comfort. We recommend that you contact your insurance company to find out what your plan will pay for. Foot & Ankle Center currently charges $400 for custom orthotics. Gout is a medical condition usually characterized by an acute red, severely tender, hot, swollen joint. The metatarsal-phalangeal joint at the base of the big toe is the most commonly affected. It is sometimes caused by elevated levels of uric acid in the blood which crystallize and are deposited in joints, tendons, and surrounding tissues. Diagnosis is confirmed clinically by the visualization of the characteristic crystals in joint fluid. Treatments include nonsteroidal anti-inflammatory drugs (NSAIDs), oral or intra-articular steroids, or colchicine to improve symptoms. Once the acute attack has subsided, levels of uric acid are usually lowered via dietary and lifestyle changes. In those with frequent attacks, allopurinol or probenecid may provide long-term prevention. Gout was historically known as “the disease of kings” or “rich man’s disease” due to its link to rich diets and consumption of alcohol. The signs and symptoms described above occur usually without any trauma or other activity changes. Hyperuricemia (elevation in uric acid) is the underlying cause of gout. This can occur for a number of reasons, including diet, genetic predisposition, or under excretion of urate. Renal under excretion of uric acid is the primary cause of hyperuricemia. The condition causes precipitation into “cooler” joints of the body resulting in an intense inflammatory response. Dietary causes account for about 12% of gout, and include an association with the consumption of alcohol, fructose-sweetened drinks, meat, and shellfish. Other triggers include dehydration, some physical trauma and surgery. Gout frequently occurs in combination with other medical problems. A combination of abdominal obesity, hypertension, insulin resistance and abnormal lipid levels occurs in nearly 75% of cases A body mass index greater than or equal to 35 increases a male’s risk of gout threefold. Diuretics have been strongly associated with attacks of gout, as well as niacin and aspirin (acetylsalicylic acid). Cyclosporine is also associated with gout, particularly when used in combination with hydrochlorothiazide. Gout is a disorder of purine metabolism, and occurs when its final metabolite, uric acid, crystallizes in the form of monosodium urate, precipitating in joints, on tendons, and in the surrounding tissues. These crystals then trigger an inflammatory reaction. The initial aim of treatment is to settle the symptoms of an acute attack, with the use of nonsteroidal anti-inflammatory drugs (NSAIDs), colchicine and/or steroids. Understanding the nature of the condition is the key to avoiding recurrent attacks or progression of the disease. Plantar warts and other types of warts (verruca) are very common to the feet. A plantar wart is a wart on the bottom of the foot. Plantar warts are generally described as a small, medium or large, elevated callused tissue that has small black specks in the center. These specks are the blood supply to the wart. Warts are caused by a viral infection, specifically by human papillomavirus 2 and 7. There are many varieties of warts with the most common being considered largely harmless. It is possible to get warts from others; they are contagious. They have an incubation period from 1 to 9 months before they are visible, making it difficult to determine where the wart virus was picked up. Mosaic wart, a grouping of numerous, closely aggregated plantar warts on the sole of the foot. Warts are caused by the human papillomavirus (HPV). The virus tends to invade the skin where there is high pressure or a break in skin integrity. Once established, the wart encapsulates and grows. This can manifest in many ways, but typically on the foot where a hard callous around the lesion forms and becomes painful. Imiquimod, Veregen are topical creams/ointment. Cantharidin, a natural blistering agent found in the Meloidae family of the blister beetle. When applied, the skin blisters and the wart comes off with the surface skin. Fluorouracil, which inhibits DNA synthesis, is applied directly to the wart (especially plantar warts) and covered (for example: with tape). This treatment is combined with the use of a pumice stone, but tends to work very slowly. Salicylic acid 60%. This dose is much higher than what is done over the counter which is usually 12%. Cryosurgery, which involves freezing the wart with liquid nitrogen. Laser treatment, which is done as an outpatient surgery under sedation. Cimetidine, has been shown to work in the removal of warts in certain studies with children. While the exact mechanism is unknown, it is thought to heighten the state of the immune system and ‘alert’ the body about the wart and destroy it. There are several over-the-counter (OTC) options. Most OTC treatments are not very effective in eradicating the plantar wart. The most common OTC treatments involve salicylic acid. Cryotherapy (freezing with Freon) is inexpensive but the disadvantage is that the OTC applicator is too large for small warts, and the temperature achieved is not nearly as effective as liquid nitrogen used in a physician’s office.